April Fools' Day is an important day for Google because there are a lot of hoaxes and crazy features to show. 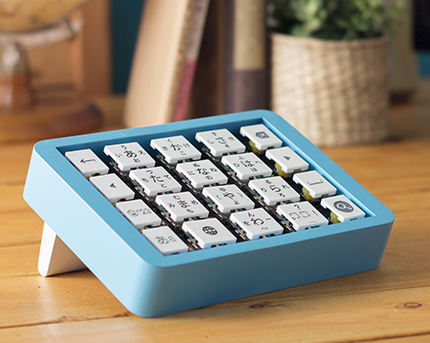 Google Japan announced a Physical Flick Bluetooth keyboard (translation). It's called Furikku and the circuit board and firmware are open source. The keyboard is actually the hardware version of Google's Japanese input software for Android. "The device consists of a button that users can ‘push’ and also a sensor that detects ‘flick’ actions. There are 12 sensors and 8 complementary action buttons so a total of 20 sensors in the device. This device can be employed by users who are accustomed to typing letters on their smartphones, but not on their desktop keyboards," mentions Google. 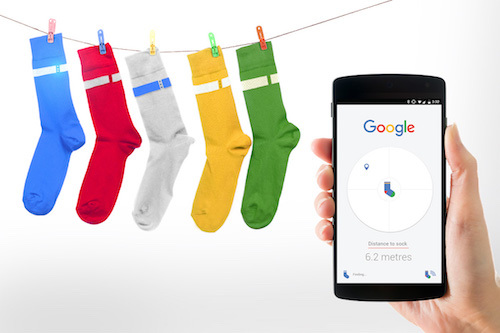 Google Australia brings Google Search for your socks. "We’re teaming up with retailers across Australia to launch a new range of Searchable Socks — to organise the world’s undergarments and make them universally findable. These new bluetooth-enabled socks are fitted with thin LTE beacons that wrap around the top of your lower calf, just like the coloured stripes you’d see on traditional socks. If you can’t find one sock, you can press the beacon on its pair and let the Google Search app on your phone pinpoint its whereabouts. The missing sock will then sing this song to help you find it." 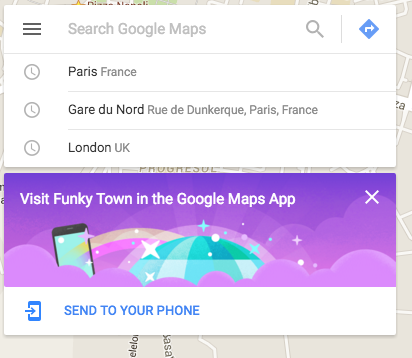 The mobile Google Maps app lets you visit the Funky Town. 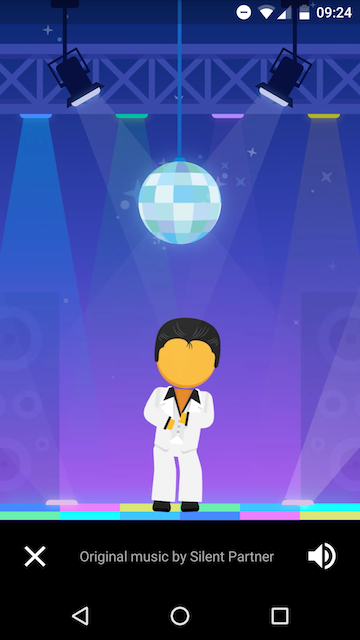 Send a notification to your phone and you can watch Pegman dancing disco. 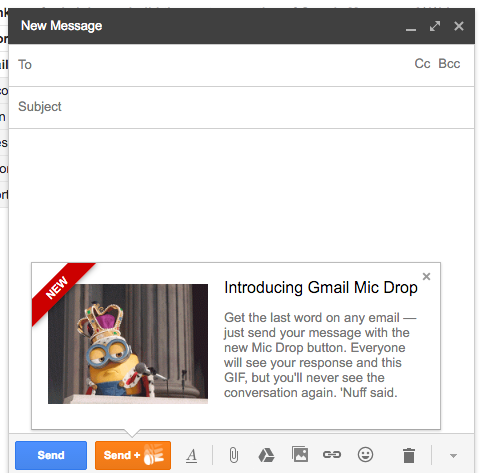 Gmail lets you "get the last word on any email — just send your message with the new Mic Drop button. 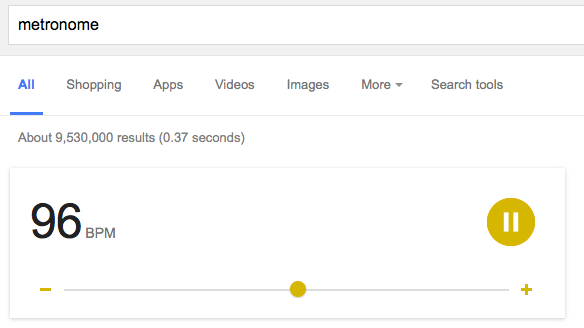 Everyone will see your response and this GIF, but you'll never see the conversation again," informs Google. 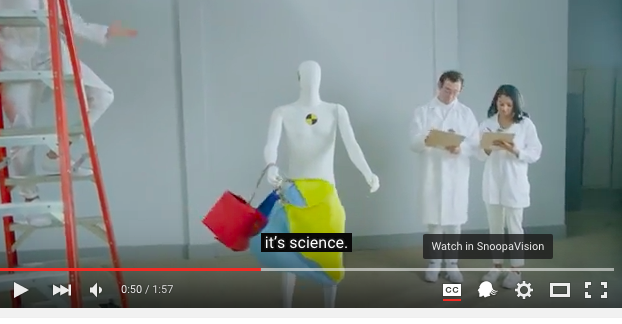 Just click the "compose" button and you'll find a new feature called "send a drop mic", which adds a GIF animation from Minions and archives the message. Google Cardboard Plastic is a plastic version of Google Cardboard. It's fully immersive, lightweight, waterproof, and works with all apps. "Cardboard Plastic is the world’s first actual reality headset, complete with 4D integrated perspective, 360° spatially accurate sound, 20/20 resolution, and advanced haptics for realistic touch sensations," announces Google. Google Express introduces a new delivery technology: parachute. "Google Express offers fast delivery of things you need from stores you love. With our new delivery technology, packages will arrive even faster and land anywhere you want them - whether you're at the beach, in the woods, or even on a run." 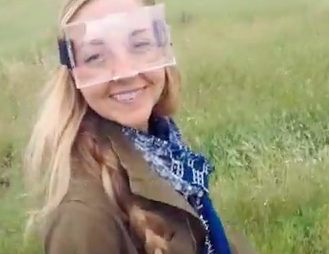 YouTube's player has a new button that lets you watch videos in Snoopavision, with state of the art 360 technology, immersive theatrical experience and Snoop Dogg integration. Google Netherlands came up with a self-driving bike (translation). "This spring, Google is introducing the self-driving bicycle in Amsterdam, the world's premier cycling city. The Dutch cycle more than any other nation in the world, almost 900 kilometres per year per person, amounting to over 15 billion kilometres annually. The self-driving bicycle enables safe navigation through the city for Amsterdam residents, and furthers Google's ambition to improve urban mobility with technology. Google Netherlands takes enormous pride in the fact that a Dutch team worked on this innovation that will have great impact in their home country." 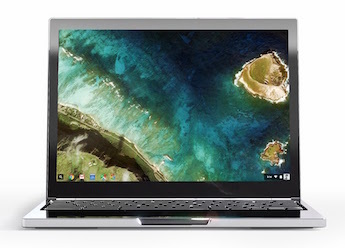 All Chromebooks come with Chrome, but what about a Chrome Chromebook? "Chrome Chromebook adds dazzle to the power of our best-in-class hardware and software, with shiny design facets to inspire a new generation. The highly reflective chrome alloy case with two layers of automotive clear-coat creates infinite reflections, enveloping the Chrome Chromebook like a shimmering sheath. The platinum white backlit keyboard LED bounces light off a minimum of seven surfaces before striking the eye, and the included microfiber sleeve helps retain that just-unboxed glow." Style detection is a new feature of the Google Cloud Vision API. "Using millions of hours of deep learning, convolutional neural networks and petabytes of source data, Vision API can now not just identify clothing, but evaluate the nuances of style to a relative degree of uncertainty. With Style Detection, we're able to mine our nearly bottomless combined data sets of selfies, fashion periodicals and the unstructured ramblings of design bloggers into a coherent and actionable tool for picking tomorrow’s trousers." 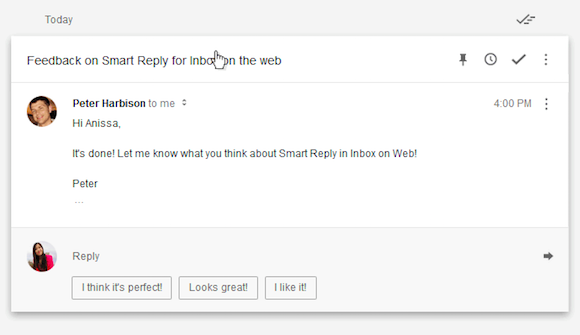 The smart reply feature from Inbox now suggests emojis. "In our testing, we've found that emoji do a better job of plumbing the emotional depths of one's soul, so we're optimistic that today's update will encourage more open and honest email conversations." 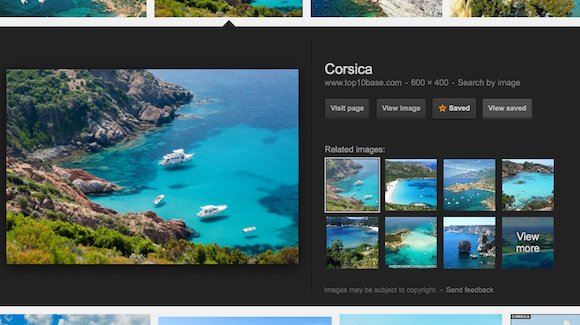 Last year, Google added a feature that allowed you to save image search results and organize them using tags. This feature was only available in the mobile interface, but now you can use it on the desktop too. 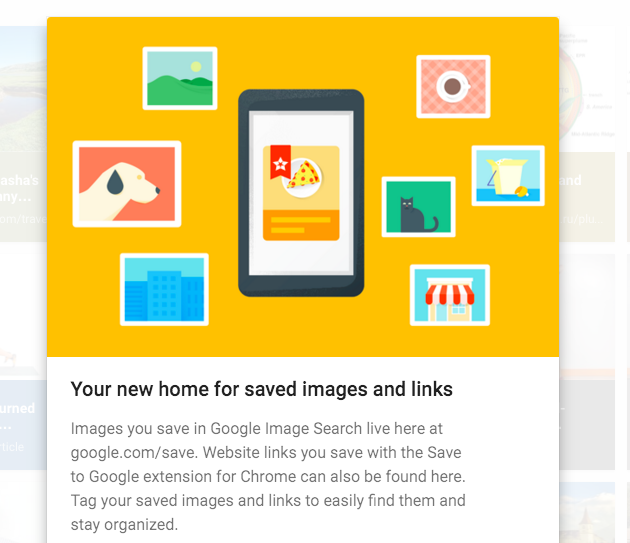 Just click the "save" button next to an image search result and then click "view saved" to go to google.com/save and manage your saved images. "This feature is currently available in the US when you search for images on desktop and in your mobile browser. 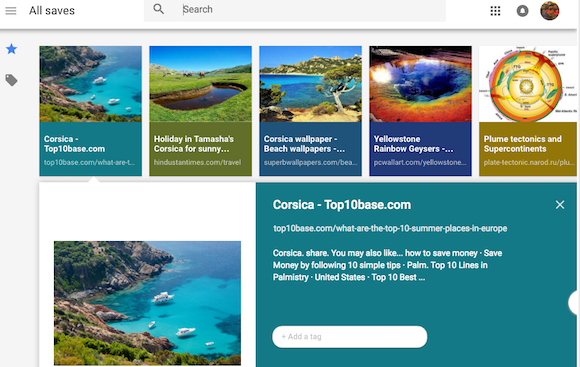 To try it out, make sure you're logged into your browser with your Google Account; then you can start image searching and saving," informs Google. The site mentions that the "website links you save using the Save to Google extension for Chrome can also be found here," but I couldn't find this extension. There's a Save to Google Drive extension, but it only saves images and screenshots to Google Drive. 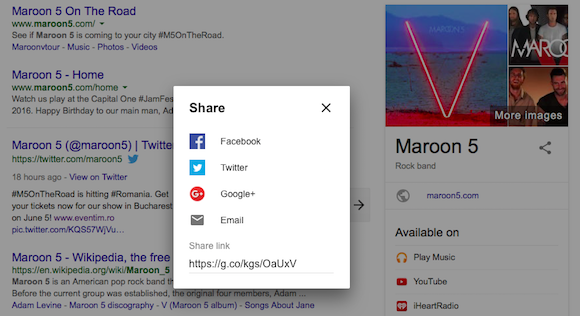 Google's Knowledge Graph cards added a button that lets you share the search results pages on Facebook, Twitter, Google+ or by sending an email. You're actually sending a link to the entire search page, not just to the card. 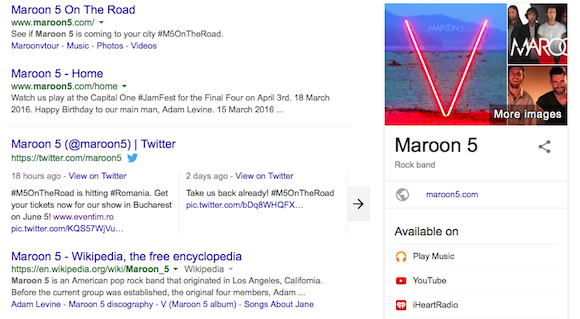 Knowledge Graph cards include a lot of useful information extracted from various web pages and other resources: images, official homepage, social network pages, Wikipedia descriptions, useful facts, events, quotes and more. Last week, John Mueller announced that Google is moving all of its blogs to a custom domain: googleblog.com. For example, Gmail's blog has a new URL: gmail.googleblog.com, which replaces gmailblog.blogspot.com. "Google is moving its blogs to a new domain to help people recognize when they're reading an official blog from Google. These changes will roll out to all of Google's blogs over time. The previous address will redirect to the new domain, so your bookmarks and links will continue to work." A long time ago, many people thought that this is an official Google blog and I had to keep explaining that the blog is not affiliated with Google. I added more and more disclaimers, but that's still not enough for everyone. 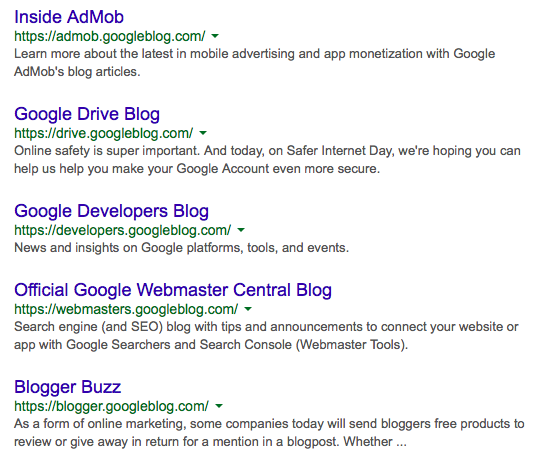 Now that Google's blogs move from blogspot.com to googleblog.com, it's much easier to tell things apart. If you're getting a lot of emails and you're tired of writing replies, Google's Inbox service has a feature that suggests 3 short replies. It was first added to the Inbox mobile apps and now it's available in the desktop site. Apparently, 10% of all the replies on mobile already use Smart Reply. Smart Reply uses machine learning to figure out if a short reply is appropriate and then predicts likely responses. "The Smart Reply System is built on a pair of recurrent neural networks, one used to encode the incoming email and one to predict possible responses. The encoding network consumes the words of the incoming email one at a time, and produces a vector (a list of numbers). The second network starts from this thought vector and synthesizes a grammatically correct reply one word at a time, like it's typing it out. Amazingly, the detailed operation of each network is entirely learned, just by training the model to predict likely responses." 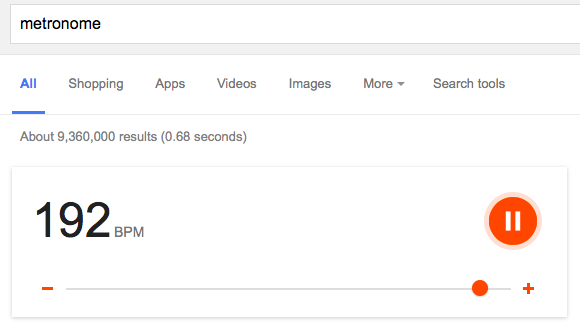 Google shows a special card when you search for [metronome]. The default beat rate is 120 BPM, but you can change the value from 40 to 208 BPM by pressing the "+" and "-" buttons. Google plays a sound, shows an animation and changes the color of the UI, depending on the selected value. According to Wikipedia, "a metronome is any device that produces regular, metrical ticks (beats, clicks) — settable in beats per minute. (...) The metronome is used by musicians to help keep a steady tempo as they play, or to work on issues of irregular timing, or to help internalize a clear sense of timing and tempo."